On September 11, 1857, in an unspoiled valley of the Utah Territory — and in the name of God — 120 men, women and children were savagely murdered.Who ordered the massacre, and why, has been hidden in a cloak of secrecy and conspiracy. And the reputation of one of this nation’s mightiest religious figures has been preserved and protected. On May 4 the truth will be revealed. With typical Hollywood hype, the September Dawn web site and trailer (available there for online viewing) is designed to get people interested, to perpetuate the feeling of “secrecy and conspiracy.” I’m guessing the film’s producers want that interest to build from now until May 4th, which should result in a strong showing at the box office. 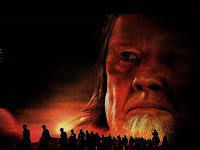 Rumor has it that the film implicates LDS Prophet Brigham Young, portraying him as an integral part of the unprovoked attack perpetrated against these non-Mormon pioneers. Some think the film will depict Brigham Young ordering the massacre, but September Dawn’s writer-director Christopher Cain says the film sticks close to the historical record. There is no proof that Brigham Young ordered the massacre; Mr. Cain says the film portrays Brigham Young as condoning what happened, not ordering the attack. A movie that hasn’t even been released yet is drawing strong reaction from The Church of Jesus Christ of Latter-day Saints. Internet previews of the film portray the infamous Mountain Meadows Massacre and strongly suggest direct involvement by then church President Brigham Young.The writer-director of “September Dawn” told us his portrayal is historically accurate. The church calls it a distortion, and some, but not all, historians agree. KSL asked eight board members of the Utah Westerners what they thought about Brigham Young’s involvement in the massacre. In a show of hands only three of the eight agree that Young ordered the massacre, and one more said Young condoned it. All eight agreed he covered up the facts. It’s no surprise the LDS Church is not happy about this movie. It will raise a lot of questions in people’s minds and it threatens to mar the carefully cultivated squeaky-clean image the Church has been working to achieve. That’s a pretty broad blanket condemnation/dismissal, especially since there’s no indication that the Church has seen the movie or read the script. It appears as if this judgment has been formed based only on the 90-second movie trailer. The day after the above was reported by KSL, the station presented another report. This one suggests the source for September Dawn was an award-winning documentary by University of Utah Film Studies Professor Brian Patrick. There is a huge uproar over a film that was set to be shown next week at the “SpudFest” Film Festival in Idaho. Gilligan’s Island actress Dawn Wells (“Mary Ann”) has been promoting her Film Festival “SpudFest” which is taking place in Victor, Idaho August 3-8. The film in question is a documentary entitled “Burying The Past — Legacy of the Mountain Meadows Massacre.” The film has won 10 awards and has played in over 15 film festivals. “SpudFest” organizers received numerous phone calls from angry Mormon protestors planning to carry signs and picket all three screenings of “Burying The Past” that were scheduled for August 4th, 5th, and 7th. The Mormons also notified festival directors that they were advising all members of the Mormon faith to boycott the entire festival. The protestors are Mormon Church Authorities, Bishops, and Church members who have never even seen the film, but are nonetheless offended. Burying the Past is known for its careful and even-handed treatment of the Mormons, the Massacre descendents, and the LDS Church; yet it was denounced as pressure was brought to bear to keep the film away from public viewing. I suggest that the LDS Church and the Mormon people are not compelled in their concerns about September Dawn by any specific content of the movie; rather, it is the topic — the Mountain Meadows Massacre — that they wish would remain unknown. First the LDS church puts out a press release condemning the content of this film, apparently based solely on its trailer. Now, the flagship television station of church-owned Bonneville Communications makes accusations of plagiarism. Both actions seem like transparent public relations moves….